Lager to most means the ubiquitous pale golden brew that arose from the original pilsners of the 1840s. But by that time, the Bavarians had likely been honing bottom-fermentation and cold-conditioning since at least the 14th century, and possibly as early as the 11th century. Those original lagerbiers were dark, as pale malted barley didn’t come to the region until the early 19th century. The style today is known as Münchener dunkel (Munich dark). Dunkel is essentially the ancestor of all bottom-fermented beers, derived from cool seasonal brewing, fermented with carefully culled, cold-tolerant yeast and aged in icy caves at the foot of the Alps. The Reinheitsgebot purity law of 1516 ensured that those beers would be all-barley. Dunkel is a seminal brew, an icon of Bavaria’s heyday, which laid the foundation to perhaps the most significant movement in the history of brewing when brewers in Bohemia, who had already begun using the Bavarian bottom-fermentation methods, combined the technique with their newly minted pale malt in 1842. For homebrewers, dunkels offer a chance to dig into the roots of lagerbier brewing, while showcasing the malt that made Munich a brewing epicenter. When brewers had limited resources and raw materials to work with, those available ingredients often came to define older, classic styles that we still see today. In Munich, toasty melanoidin-rich malt was preferred and became the key, definitive ingredient in dunkel. Typically, dunkels were made as a single-malt brew. Munich malt is full amber to brown in color due to relatively high kilning temperature, yet is fully capable of self-conversion, making possible an authentic historical single-malt brew. Most brewers employ more diverse grists, but still feature the unique footprint of Munich malt. This according to Michael Jackson, who mentioned grist composition in his Beer Companion, and a perusal of recipes given online by various breweries. With that strategy in mind, we can exercise some flexibility to achieve desired color and flavor. Excellent dunkels can be made with two or three malts. My preferred recipe is equal parts light (about 6 degrees L) and dark (about 9 degrees L) Munich malt for 95 percent of the bill, and 5 percent Cararoma (150 degrees L). This formulation will provide a healthy dose of maltiness, red-brown color (23 SRM), suitable fermentability and a sweetish, caramel background. Other common formulations use pilsner and Munich malt combinations for the base and Caramunich (30 degrees to 60 degrees L) and Carafa or Carafa Special (300 degrees to 560 degrees L) for color and depth. Dunkel color is typically 18 to 28 SRM. To round out the rich, malty profile and enhance the mouthfeel, use a two-step infusion mash with a protein rest at 113 degrees to 122 degrees F for 20 minutes, followed by saccharification at 152 degrees to 153 degrees F for one hour. Single-step infusing will work, but two-step will more completely break down the protein-rich continental malt. Decoction mashing, while not necessary, may be attractive to the diehard traditionalists. Original gravity should be between 1.048 and 1.055. 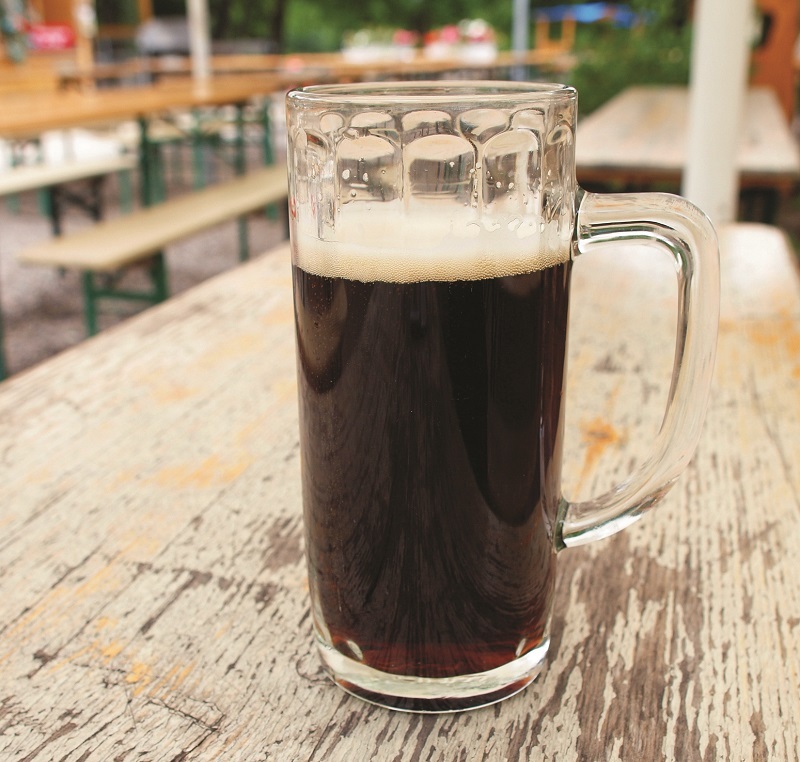 For extract brewers, fine, authentic dunkel is easily within reach. Liquid malt extract labeled as Munich is a 50/50 blend of pale or pilsner and Munich malt, a perfect ratio for the style. The steeped specialty malts mentioned above combined with this extract are all that is needed. Partial mashers can stay on point with this extract as well. While hops take a back seat to the malt in this style, dunkels nonetheless rely on a dose of bitterness (20 to 25 IBU) sufficient to balance their soft sweetness. For later kettle additions, it is critical to note that however mild the flavor and aromatic components, it is this subtle character that helps define the origin of the beer. In this case, that distinctive German accent should be noticeable. Noble German hops—Tettnanger, Hallertauer Mittelfrüh and Spalter—are, naturally, the best option, with the spicy, floral notes and rounded bittering contribution associated with low-alpha acid cultivars. There are no shortcuts or secrets to making great lagerbiers, and all of the work put forth in the mash tun and kettle would be wasted if proper bottom-fermentation and lagering techniques were not followed. The best yeasts come from breweries in Bavaria or, more specifically, Munich. These allow the malty flavors and aromatics to flourish, and they attenuate fully under proper conditions with a good mouthfeel and clean, crisp finish. Wyeast Munich 2308 and Bavarian 2206, and White Labs WLP838 Southern German and WLP920 Old Bavarian are the best in my opinion. Fermentis offers two dried lagerbier yeasts that are highly regarded, Saflager S-23 and Saflager W-34/70, and perform as well as liquid yeast. The recommended yeasts will do yeoman’s work between 48 degrees and 56 degrees F with proper aeration and sufficient cell counts at pitching. Pitch and ferment at the lower end of the range, to eliminate the risk of exceeding the upper limit of the suggested temperature range for fermentation during the initial burst of activity and the formation of off-flavors. Always perform a diacetyl rest, 60 degrees F for 48 hours, to scrub the wort clean before cold-conditioning. Lager at 30 degrees to 40 degrees F for 6 to 8 weeks before packaging and serving. The Czech Republic is known for excellent pilsners, the revolutionary beer that combined German brewing methods with innovative pale malt in Pilsen in 1842. Some of its breweries also offer dark lagerbier, a creative interpretation of the style that I find as delicious and fun as the Munich version. Design a grain bill that leans toward the dark end of the stylistic spectrum and dose with Saaz hops throughout, with an extra measure of late kettle hops. Try Moravian malt if you can get it. Ferment with Wyeast 2000, 2001 or 2278, or White Labs WLP800 or WLP802, all of which come from renowned Czech breweries, and stamp a malty, dryish, slightly fruity footprint that favors an aromatic, robust profile. Notes: Pilsner or Vienna malt can be substituted for light Munich for a crisper finish, and a blend of hops for the flavor and aromatic additions. Ferment with Czech yeast recommended above at 50 degrees F, perform diacetyl rest, and cold-condition using standard bottom-fermentation schedule.